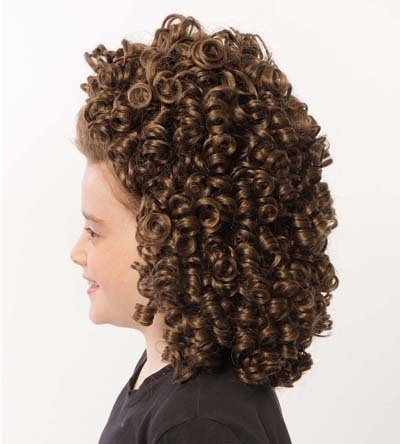 Here is a guide for dancers and parents who are new to Irish dance wigs and need some help getting the right wig. Buns and Full Length Wigs..
Wigs are normally divided into two main types of wigs; bun wigs and full length wigs. Bun wigs are bun shaped and typically sit on the back of the head over the dancer's normal hair (or over a donut but we will come on to that!). 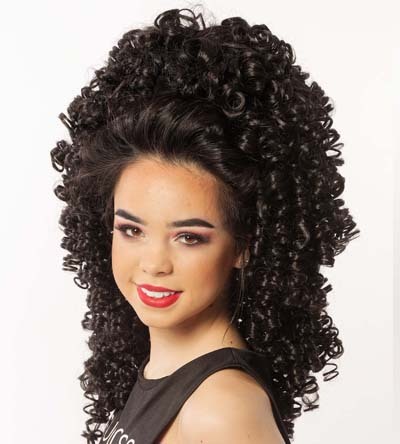 Full length wigs usually come down to, or below the shoulder line and are available in varying lengths, so think of the height of the dancer when choosing the length (younger dancers typically look better in the medium length full wigs). Both styles are worn by dancers of all ages and which one to go for is a matter of personal preference. 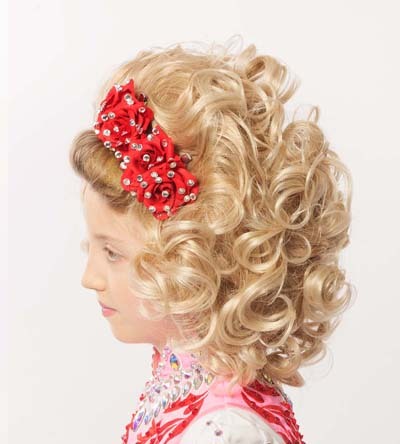 Ceili teams often opt for the same type of wig as this can look better on stage. You will see some of the product descriptions mention donuts. No they are not the donuts you might buy in a bakery. Hair donuts are the same shape as the sugary kind but made of lightweight sponge. They are used by dancers who want more height or volume for their wig. The dancer's natural hair is pulled into a small pony tail and is threaded through the donut and pinned. This creates more bulk for the wig to sit on. Hair donuts are available in different sizes and in a few colours so dancers can match it to their normal hair colour and create the effect they are looking for. Example of dancer with a double donut. Not all wigs can be used with a donut so check out the product description to make sure the wig you like can work with one. There are lots of tutorials on You Tube if you want some help on how to use one! Different wigs have different styles of curls. 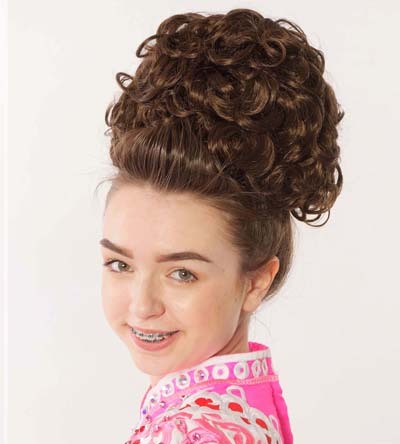 The traditional Irish dance wig such as the Vivien full length wig or the Shelly bun wig have tighter ringlet curls and is how some people picture traditional Irish dancers. 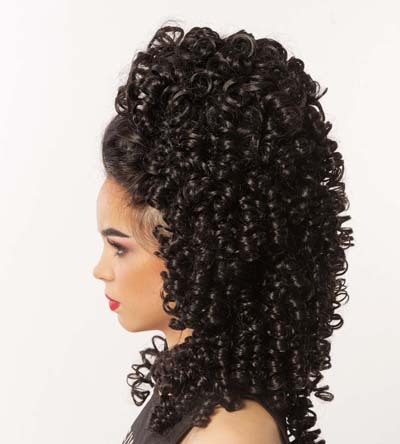 Other styles such as the Michaela full length wig or the Keara bun wig have a looser wave curl. Both styles are worn by dancers of all ages so just go for the style you like the most. Some styles have more curls than others. For example the Keara Double Curl has more volume and slightly longer curls than the Keara Single Curl. You don't necessarily need to pick a wig colour which matches your natural hair colour as you can spray colour any exposed natural hair at the front of the wig to compliment your choice of wig colour. However if you want a simple to apply wig which needs minimal post fitting work then pick a complimentary colour to the dancers natural hair colour so you do not need to spray colour the natural hair at the front. It is also worth thinking about the dancer's skin tone when choosing a colour. Remember it is the skin tone you 'wear' on stage that matters so if you self tan then think of that colour when choosing your wig. Another thing to keep in mind is the colour of the dress. Team dancers may choose to co-ordinate wig colours to maximise the wow factor on stage. We have put together a colour chart of the different wig colours to help you decide the best colour for you. Please note that not all colour options are available for every style of wig. If your preferred colour is not available then choose the closest one to it. Click here to view your wig colour options. Keeping the wig in place..
All of our wigs come with two combs, one at the front and one at the back to fix the wig through the dancer's natural hair. Some styles also come with elastic draw strings for additional security. 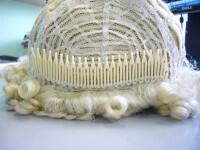 One of the wig combs used to secure the wig in place. Bobby pins are your friend here and they should be a key part of your feis bag. Once the wig is fitted on the head use plenty of bobby pins to fix the wig securely in place. 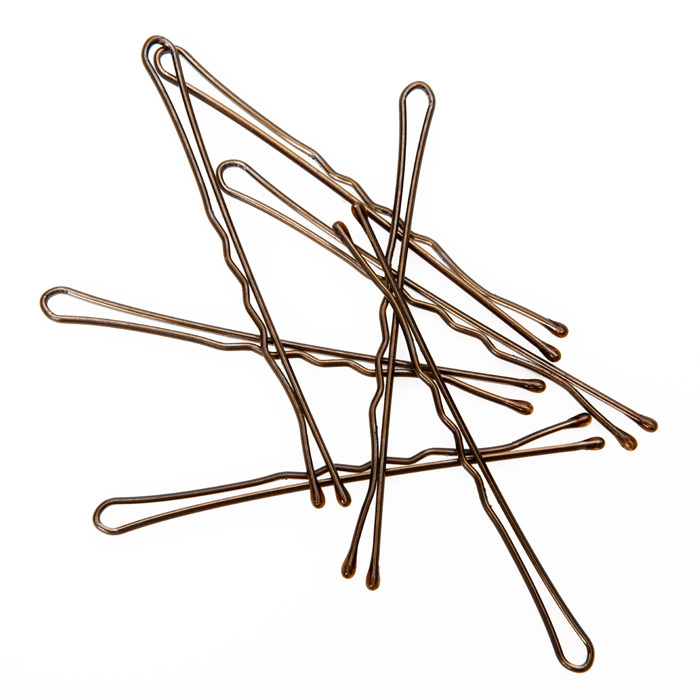 Bobby pins come in different lengths depending on what you need. If in doubt use another pin! We recommend that you use U-shaped bobby pins if you need to fix through the wig. Only use normal bobby pins on the side of the wig to clamp it on. Normal Bobby Pins to use at the sides to clamp wig on. Most dancers like to finish their look with a tiara, headband or bow. There really are no rules here so pick a final look which matches your personal style, budget and dress. Putting on a wig can be stressful for new parents or dancers but it does take practice. There are plenty of You Tube videos on how to get a wig looking its best so google for the type of wig you have, such as 'how to fit a bun wig' and you will have plenty of dancers and professionals ready to share their expertise and take you through the various steps! Nobody wants to buy a wig and think it has been on other dancer's heads before their own. So for this reason we do not accept wigs back once they have been purchased. So please make sure you are happy with the style and colour before you purchase.